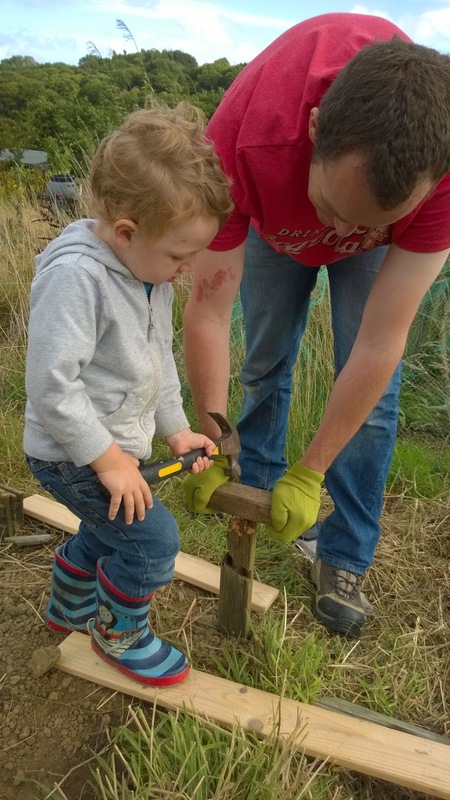 A serendipitous meeting with a lady at a playgroup led to us getting an unexpected allotment just over a week ago. Ollie had been wanting a bigger garden for along time, and our patio fruit and veg were taking over the small space we have at home, so when I met a lady who said there were plots being made available at her allotments I decided to take the plunge. I was expecting a long wait - typically it can take years, but the day after she took a request letter in to her allotment association for me I got a phone call asking if I wanted to go an view a plot. 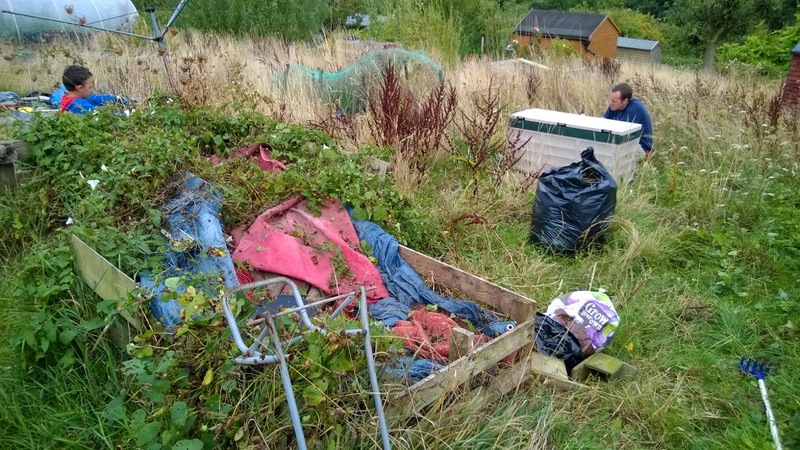 The plot looked in bad condition with every inch covered in weeds, including some dock and a lot of large bindweed, but the soil looked reasonable when I poked in a scraping made by a badger and the allotment people seemed welcoming and helpful. There is even a clubhouse shed where you can buy reduced rate seeds and composts, plus kids and sheds are welcome, so we signed up and got stuck in. The plot had been split in half and a '5 rod' plot was still three times the size of our back yard so it seemed more manageable for us while we're learning. Much to our delight it turns out that a lot of work had been done by the previous tenant, who unfortunately had to give it up. Under the weeds we found compost bins and areas under plastic which were weed-free and ready to dig over. I cleared the bindweed and bagged it up to take to the green waste recycling place at our local tip. I know this is a weed experienced allotmenteers tend to burn but I though it unlikely to dry out enough for that before it rooted again. Since it grows from any scrap of broken root I expect to be trying to keep on top of the bindweed for a long long time. The boys enjoyed pulling it up (wearing gloves) and helping to push weeds around in their little plastic wheelbarrow. 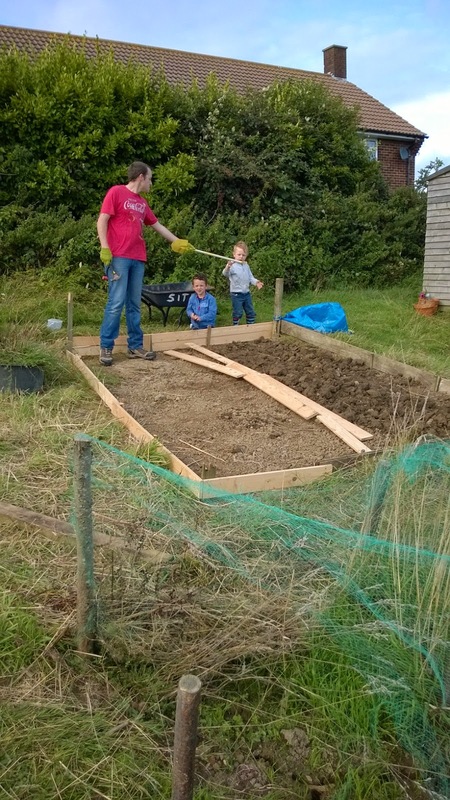 I then moved on to digging, while the boys built sides around the first bed using wood found on the plot and some slats from our old bed. They were so excited to be using the hammer and saw (under close supervision), so we have unexpectedly added woodworking skills to our home education curriculum. Working with their hands to pull, push, grasp and manipulate are all fantastic for building up the muscles in their hands they need for writing and other fine skills. Building is also a great feel-good experience because they have undivided attention while they do it and can look back at the end of the brilliant structure they have contributed to. While I was digging a slow worm (a legless lizard) shot out from under my fork, so we all stopped to admire the beautiful creature before finding a nice quiet space by the compost bins for it. I was 23 when I saw my first slow worm, despite having great parents who took us out and about in the fresh air all the time, so I'm amazed about the things the boys have already seen. We have put in a cloche with winter cabbages, sprouting broccoli and leeks, plus transplanted some over-crowded strawberries from our pots at home. The allotment will certainly cement the boys understanding of where food comes from, how plants grow, and why we don't waste food. I'm hoping to get another cloche and sow some salad leaves and pak choi this afternoon. We got a great haul of discounted packets of seeds (50p a pack) from our local garden center so it seems worth the gamble of sowing a few things this late in the season. We've also sourced an almost free shed because we can use our Tesco clubcard vouchers to pay for one on their website (£80 of vouchers for a £160 shed). This outside space is already proving to be an exciting learning space and the possibilities for it are endless as we find ways to integrate encouraging wildlife with growing our own food.